Our family love boat trips. They give us a different perspective on the place we are visiting and we get to enjoy our holiday at a completely different pace. 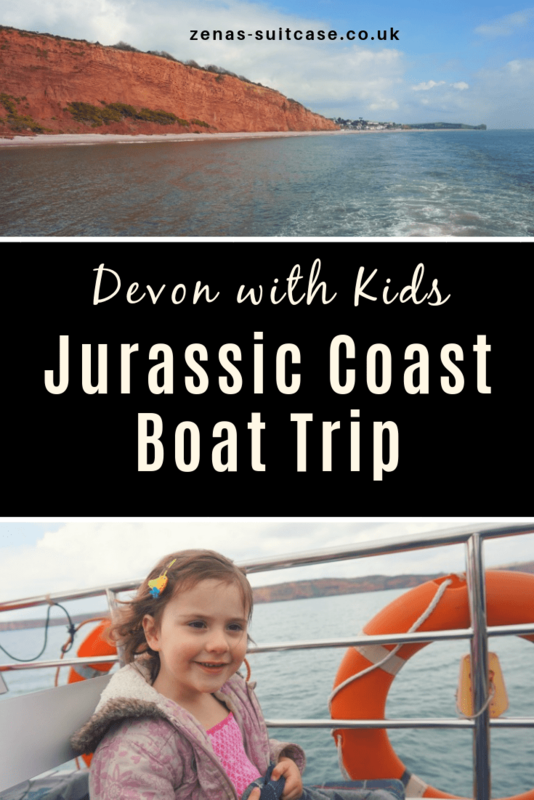 Devon is literally perfect for boat trips, and we joined Stuart Line Cruises for their Jurassic Coast Tour during our family holiday last month. We joined the boat trip in Exmouth and I’ll be honest in that we had literally minutes to board before the boat departed. This is totally my fault for not giving us enough time to get there but I wanted to mention it as it’s really important to give yourself plenty of time to park and get to the boat. There is a small car park near to the Stuart Cruise Line office, and we did manage to get a space. I think we were pretty lucky really as it was early in the morning and the holiday season wasn’t fully underway. There is parking along the promenade as well but if you use this give yourselves 10/15 mins to walk to the boat. 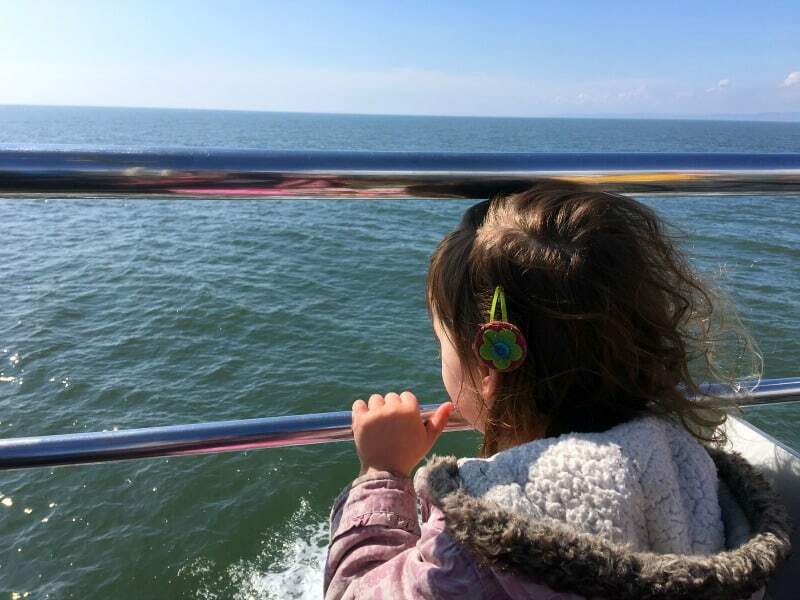 After our little dash to join the Jurassic Coast tour with the kids, we boarded the boat and headed straight to the top deck. It was a beautiful blue sky day and this was definitely the place to be. There were blankets on our seats just in case the sea breeze got a bit nippy and the lovely staff came round and took our drinks order. There is a fully licensed bar on board Stuart Line Cruises boats and they serve a variety of snacks too. I saw some lovely fresh scones with jam and cream coming out of the hatch and it was a hard job to resist I can tell you. We had taken a packed lunch for the boat tour just because our kids are ALWAYS hungry!! The sea air also helped to boost their appetite for this particular trip. Our boat trip was soon underway and we really enjoyed the live commentary on board. He didn’t speak for the whole trip, which was nice actually as it gave us chance just to soak up the views of the Devon coast line as well as learn a little of the history of this natural phenomenon. He mentioned at the start of the cruise that sometimes there are dolphins, but it was probably a little early in the season to spot them. Brook just heard dolphins and fixed her eyes on the horizon in the hope she would get to see some. I didn’t have the heart to disappoint her. Our Jurassic Coast boat trip lasted 2.5 hours which I though was excellent. In hind sight, I should have packed some toys and colouring books for the kids though. They did love being on the boat but their attention did start to wander a little at points, which with my two generally means they start getting into mischief! 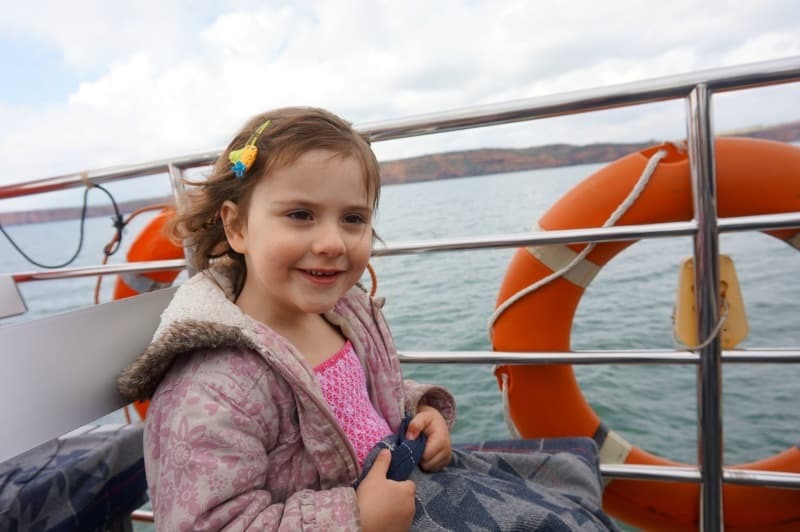 Perhaps Stuart Line Cruises could offer children a Jurassic Coast activity pack to help them make the most of the cruise. I think this would make a fantastic addition to the trip for young passengers. Points of interest along the way excludes the Royal Marine firing zone, but don’t worry, when it’s being used there is a large exclusion zone in place. We passed by the beautiful seaside town or Sidmouth also but the highlight was reaching the oldest part of the Jurassic Coast and seeing the incredible rock formations. Parts of the Jurassic Coast are 250 billion years old and you can see the layers of rocks that have settled here. It’s also brimming with wildlife and is perfect for birdwatching. As well as learning lots of facts about this incredibly interesting and stunning natural landmark it was also sad to hear and witness the erosion and landslides that are taking place along this piece of coastline. The Jurassic Coast isn’t necessarily going anywhere soon, but the cliffs are eroding at a rate of around 10cm every 10 years as it’s under constant threat from the elements and the sea. 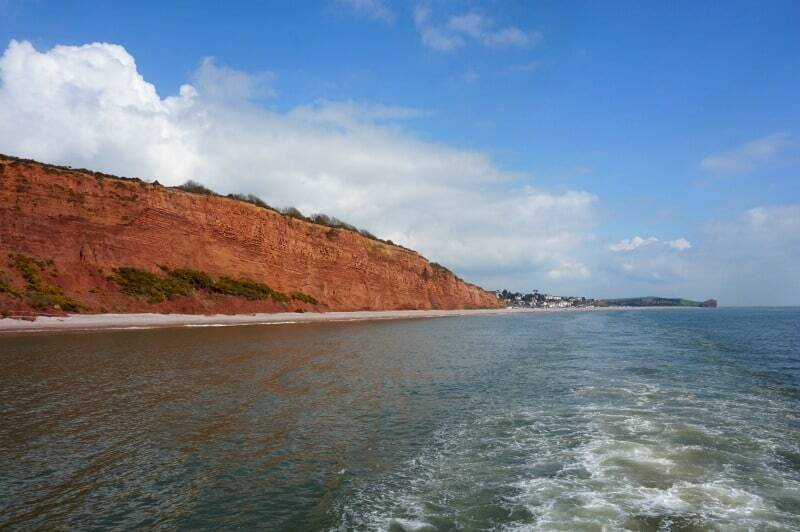 We thoroughly enjoyed our Jurassic Coast boat trip with Stuart Line Cruises. It helped us to further enjoy the historic and unique part of the UK and it works so well if you are planning doing some fossil hunting on the beach or visiting Seaton Jurassic with the kids. If you are keen to see more of this area, The Life of Spicers share their experience of walking along the Jurassic Coat in Dorset. The boat was great, with lots of space for all the passengers, a lovely crew and a well stocked bar. The top deck was open plan seating but below deck was enclosed with tables and chairs if that’s what you preferred. Moving around the boat and changing seats when we wanted wasn’t an issue for us either. To make the most of your Stuart Line Cruise make sure you have a camera or fully charged phone for taking photos and videos. Give yourself plenty of time to park your car and getting to the boat and I’d definitely suggest taking a few snacks and things to entertain the kids during the trip. 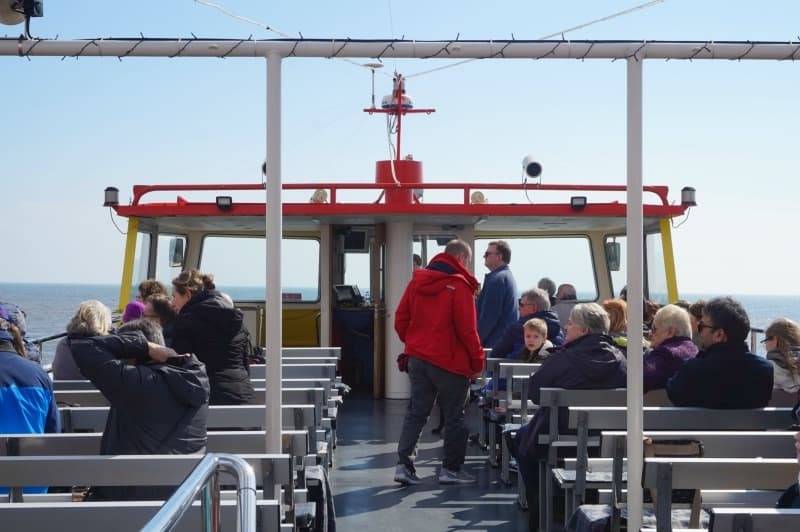 We were provided with complimentary tickets to Stuart Line Cruises Jurassic Coast boat trip by Devon’s Top Attractions. Also, for more information about activities and things to do in the area, Visit South Devon gives families lots of hints and tips making the most of your holiday in Devon. Sounds like a brilliant little boat trip. We like to visit the Jurassic coastline here in Dorset quite often – never took a boat tour but it certainly something that we’ve though about before. this sounds like a great idea, I didn’t;t realise you could do this. Definitely something to look into.